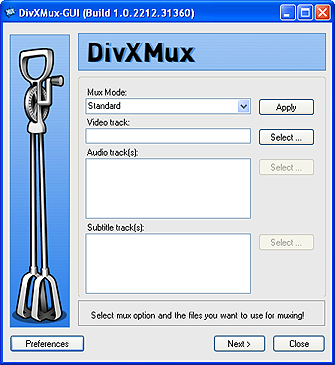 DivXMux GUI is a Graphical User Interface for the command line orientated DivXMux.exe from the DivX Media Tools. It muxes (combines) video, audio and subtitle streams into one DivX Media file. It should be especially useful for those of you, who suffer from the Doctor DivX 2.0 current mux- and synchronicity-bug, as you can at least try to rescue the Doctor's output. If the Doctor refused to mux the streams from the temp folder, you can try to do it manually. If the output is out of sync, DivXMux supports positive and negative values for audio-delay. Additionally it offers you the possibility to mux your original mpeg audio into the DivX file, without having to convert it to mp3, even if it isn't AC3. Or you could mix AC3 and mp3 tracks. You could have done all this already with DivXmux.exe. But now you can do it without having to do a lot of typing. Join several video files into one.